Purchase a new ZEN Redstone townhome and we’ll fly you home to surprise your family with a spontaneous visit for the holidays. You can tell everyone the exciting news that you’ve bought your first new home in Canada. Wow! Just think about that. What an accomplishment! You can coordinate your trip to celebrate any number of holidays back home, or an important event like a family wedding, a major birthday or anniversary. Or you can choose to reverse the offer and invite your family to visit you here in Calgary so they can see your new multi-bedroom ZEN townhome for themselves. They’ll be super impressed! Whether your family is halfway across the country in Ontario or the Maritimes, or halfway around the world in India or the Philippines, this fantastic offer is one you can’t pass up! You’ll be regarded as a successful member of your family who worked hard and saved to invest in a new home for your family’s future. ZEN Redstone has a variety of floorplans available with more than enough room to comfortably accommodate visiting family members who come to see your fabulous new home. 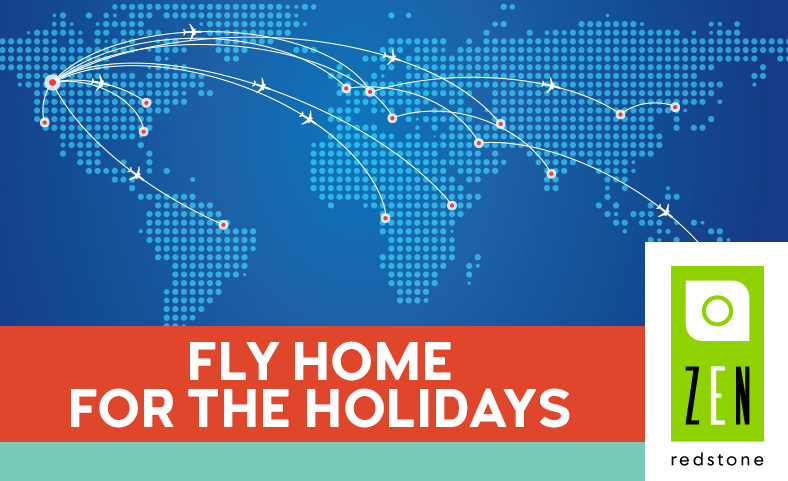 Come visit our showrooms and presentation centre for more information on how to Fly Home For The Holidays. Hurry! Pack your bags for the move into your new ZEN Redstone townhome and for your surprise trip home for the holidays. Posted in Calgary Townhomes, Home Ownership, Lifestyle, Promotions, ZEN Redstone | Tagged in Tags: calgary, New Home, promotions, Redstone, Townhomes, yyc, yycre | No Comment.